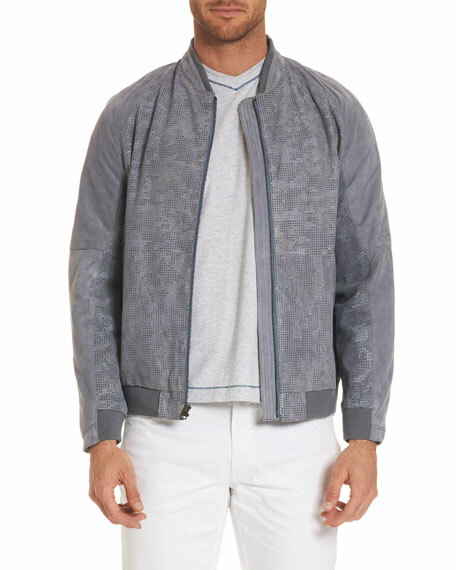 Robert Graham "Ricardo" bomber jacket in perforated suede. Hudson bomber jacket with French terry cloth lining. Drawstring hooded neckline; zip front. Long sleeves; zip pocket on left. Side slip pockets. Relaxed fit. Straight hem. Nylon. Cotton lining. Polyester/spandex trim. Imported. Model's measurements: Height 6'1"/185cm, waist 32"/81cm, typically wears size M.
Loro Piana bomber jacket in water-resistant techno-wool. Baseball collar; zip front. Rib-knit cuffs. Side slip pockets. Classic fit. Straight hem. 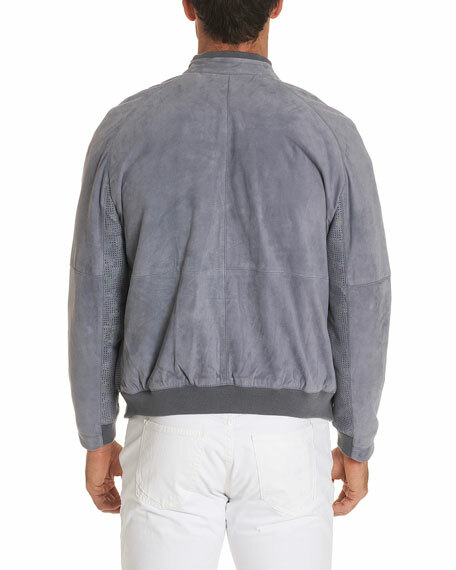 Loro Piana bomber jacket in water-resistant techno-wool. Baseball collar; zip front. Rib-knit cuffs. Side slip pockets. Classic fit. Straight hem. Virgin wool/spandex/nylon. Polyester/nylon/spandex lining. Made in Italy. Model's measurements: Height 6'1"/185cm, waist 32"/81cm, typically wears size M.
Michael Kors bomber jacket in camouflage felted melton wool blend. Solid ribbed collar, cuffs, and hem. Stand collar; two-way zip front. Long leather sleeves. Side zip pockets. Blouson fit. Hip length. Wool/nylon. Imported of Italian material. Model's measurements: Height 6'1"/185cm, waist 32"/81cm, typically wears size M.